A golden stout? Only Stone. Yeah, so right off the bat this beer is meant to screw with your head. What looks like a typical Double IPA is actually a big Imperial Stout brewed with coffee and cocoa. To say I'm intrigued is an understatement. Pours a transparent dark orange with no carbonation bubbles. Gave off less than a finger of white head which didn't stick around at all. Aromas of coffee and roasted malt hit me first. Maybe more burnt coffee grounds than anything else. Can't say the cocoa is too present. It really just smells like a standard stout with hints of coffee. Just when I think I have this beer figured out it throws a wrench into my opinion. Immediately I am hit with a big hop presence much like a Double IPA. Those typical garlic notes that are a staple in Stone IPA's are once again here, but not as strong. The middle of my tongue catches the stout characteristics with some bitter coffee and some significant roasted notes. The finish is all barley and roasted malt. Considering this is pegged as an Imperial Stout, the mouthfeel isn't exactly a thick and luscious coating to your tongue, but rather more along the lines of a Triple IPA with it's syrupy feel. There's no carbonation to speak of and its syrupy consistency can come off as a bit chewy, but at the same time it is a watered down chewiness similar to cough syrup or NyQuil. It's weird to describe, but just something you need to experience for yourself to understand. 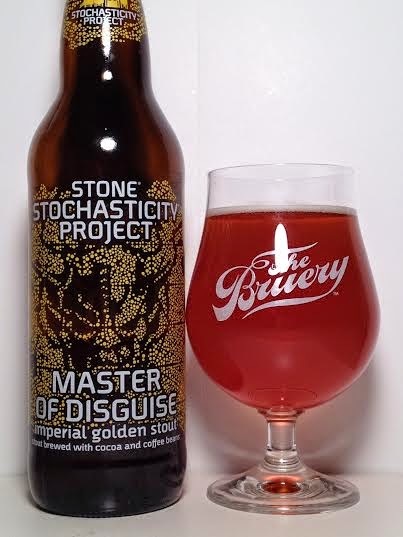 If nothing else, Master of Disguise is an experimental attempt at something different. While it does blend some Imperial IPA characteristics into your everyday stout, in the end this feels more like a beer that doesn't know what it wants to be rather than a hybrid of two different styles of beer.